goin have a good time!! thanks for the kind words guys - i had a great day. i got the Star Trek: TAS box-set as a present, so now my entire original series dvd collection is complete - that includes tv series' and movies. Happy Birthday JT1138! Have a great one! JT1138 I hope you have a Happy Birthday. Happy Birthday Hemble! May all of your Trek wishes come true! IS that ICE CREAM CAKE???!!! ME WANT ME WANT!!! I'll have a small corner piece please with lots of icing.....Happy Birthday!!! Happy Birthday Jules!! May all your (dirty) Shinzon dreams come true!! Interests:Collecting Art Asylum 7&quot; Star trek action figures. Star trek &amp; writing fan fiction. ^^^LOL! Thanks! I (dirty) dream on.....in the meantime I have a Chain of Command Data to open...hehehehe! Happy Birthday Julie, and many many more!!!!! Thanks guys! 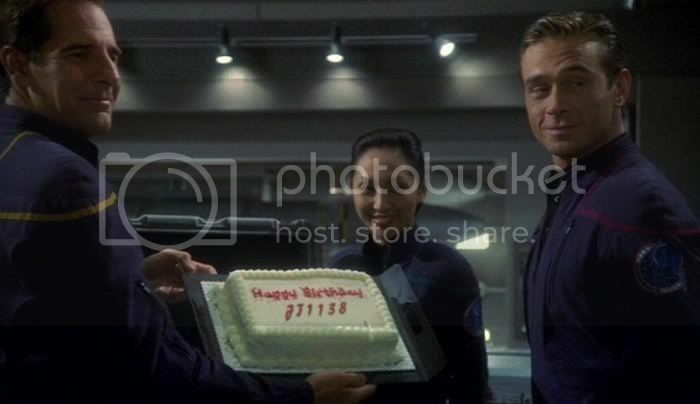 That Enterprise birthday cake is such a cool idea! I love it! !